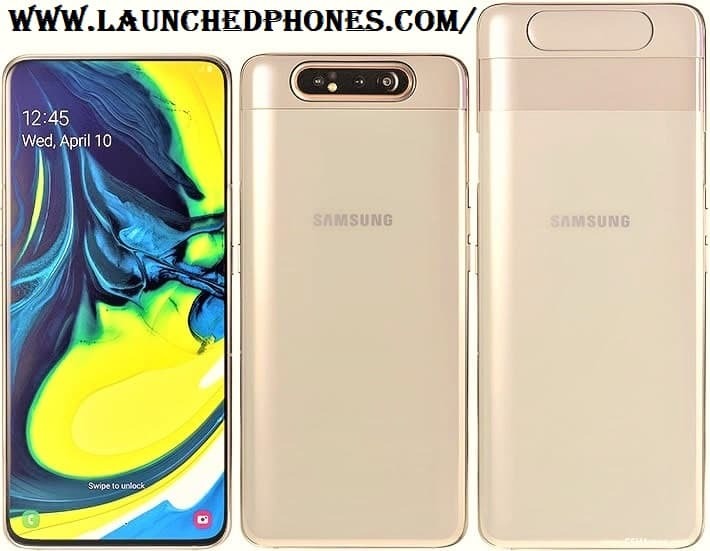 Samsung Galaxy A80 mobile phone launched in Thailand with pop-up and rotating 48 MP cameras. This is the largest Samsung smartphone also with the higher specs and features. The Samsung A series event was held in Bangkok, where the company launched this mobile phone. 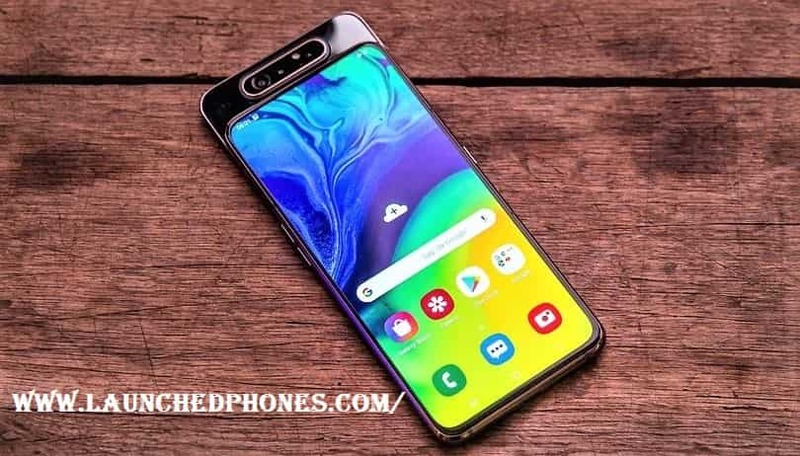 This phone is launched after the Samsung Galaxy A10, A20, A30, A40, and A50 smartphones. This is the first phone of this type and the design is really impressive. The pricing is not confirmed by the company and there is no confirmation about the launch date of this phone also. This is a dual-Sim phone with dual-VoLTE, Bluetooth, Wi-Fi, Samsung Pay, etc. The fingerprint sensor is placed under the display. The 3700 mAh battery is used in this phone and this battery supports 25W Quick-charging. There is no slot to put the memory card and there is no 3.5mm jack, which is the major drawback of this phone. The USB Type-C port used at the bottom of this phone. This phone launched with a 6.7 inches massive display size, which is ridiculous for me. The Super-AMOLED display panel is used in this phone with the FHD+ resolution. The display resolution of this phone is 1080x2400 Pixels and the aspect ratio is 20:9. The Pixel density is 393 PPi, which is good for the Super-AMOLED display panel. The phone is launched with the Android 9 Pie and it runs on the Samsung UI. Latest Qualcomm Snapdragon 730G octa-core processor is used in this phone, which is made for the gamers. This SoC runs on the 8nm architecture. Two clusters are used in this SoC, the first cluster comes with 2.2. GHz clock speed and this is a dual-Core and another one comes with 1.7 GHz clock speed and this is Hexa-core. 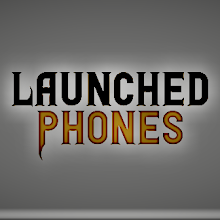 Latest Adreno 618 GPU is used in this phone to handle the heavy games with highest Graphics. The 8 GB RAM is used by the company in this phone to handle the heavy multitasking. The internal storage is 128 GB and there is no slot to put the memory card. The triple-cameras are used on the rear side and these same cameras will be used to take the selfies. The 48+8+TOD 3D sensors are used in the phone. The 48 MP camera sensor comes with f/2.0 aperture and PDAF technology is used to take the shots of moving objects. The TOD 3D sensor will capture the depth and 8 MP sensor is an ultra-wide sensor, which comes with f/2.2. aperture. This camera setup will record the 4K videos, which means you can record 4K videos from the front sensor also😃. This phone is really a new type of innovation but this is not a perfect phone. The display size is too big and this is not a practical display size but you will love this display. The processors are one of the best for the pricing because this SoC is made for the heavy gamers. The cameras and everything is good and you will love this phone but keep remember, there is no slot to put the memory card and there is no 3.5mm jack also. I am giving the pick to this phone but because of the design and specs. You will surely face the problem to handle this phone and no 3.5mm jack is also a drawback, so remember these things before considering the phone.